Free distribution of technical material and periodicals is restricted. 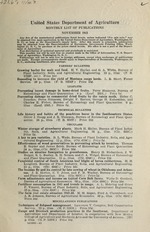 Snment of Agriculture, Washington 25, D. C.
S D. C., enclosing remittance, plus postage. Plant Industry, Soils, and Agricultural Engineering. 19 p., illus. (F. B. Service. 26 p., illus. (F. B. 1924F.) Price 104. Entomology and Plant Quarantine. 4 p. (Leaf. 235L.) Price 50. Preventing damage to commercial dried fruits by the raisin moth. Heber C.
illus. (Leaf. 236L.) Price 54. Life history and habits of the peachtree borer in the Southeastern States. antine. 24 p., illus. (T. B. 854T.) Price 104.
cultural Engineering. 12 p., illus. (Cir. 676C.) Price 54. H. Snyder and James Zetek, Bureau of Entomology and Plant Quarantine. 24 p., illus.,(Cir. 6830.) Price 104. Studies on nicotine fumigation in greenhouses. Henry H. Richardson, J. W.
and Plant Quarantine. 15 p., illus. (Cir. 684C.) Price 104. Fungicidal control of South American leaf blight of hevea rubbertrees. M, H.
Langford, Bureau of Plant Industry, Soils, and Agricultural Engineering. 20 p., illus. (Cir. 686C.) Price 100.
and Plant Quarantine. 10 p. (Cir. 687C.) Price 50. Bureau of Agricultural Economics. 59 p., illus. (Cir. 688C.) Price 100. P. Vincent, Bureau of Plant Industry, Soils, and Agricultural Engineering. 55 p., Illus. (Cir. 689C.) Price 100. Service. 22 p., illus. (M. P. 528M.) Price 104.
p. illus. (M. P. 529M.) Price 104.
fective November 1, 1943. Bureau of Animal Industry. 4 p. (B. A. 1. A summary of the literature on milkweeds (Asclepias spp.) and their utilization. Cotton quality statistics United States, 1942-43. Food Distribution Administra-. tion. 58 p. (CS-5). Price 150. Dairy and poultry market statistics, 1942. Food Distribution Administration. Index to publications of the United States Department of Agriculture 1936-1940. Mary A. Bradley, Office of Information. 763 p. Price $1.50. operation with Office of War Information. 14 p.
tomology and Plant Quarantine. (AWI-32). Folder. Southwestern stockman-Play to win! I Kenneth W. Parker, Forest Service. Agricultural Engineering. p., illus. (AWI-77.). or subscription from the Superintendent of Documents. Consumers' guide. Vol. 10, No. 1, December 1943. Limited free distribution. domestic; 450 a year, foreign.' Quarterly. These may be obtained from the Imsuing bureau. I Apply to Office of Experiment Stations. ment Printing Office, Washington 25, D. C., enclosing remittance to cover cost of publication. States Department of Agriculture, Office of Information, Washington 25, D. C.
of the publications selected, plus postage, amounting to one-third of the cost of the publications. nabe and address plainly on reverse side of this form. 84 foreign.1 Not distributed free to individuals. libraries and to institutions or departments doing research work. station for its staff, cooperators, and for such other distribution as can be made. ington, D. C., at 50 each. The Office of Information has none for general distribution. seedlings by Pythium and Rhizoctonia (Wis.-138). L. F. Roth and A. J. Riker. (E-95). A. L. Curl and E. K. Nelson. lamb-fattening ration (Okla.-30). H. M. Briggs and V. G. Heller. Measurement of the resistance of peas to aphids (Wis.-143). C. D. Harrington, Ed. M.
Searles, R. A. Brink, and C. Eisenhart. beets grown for seed (K-330). Orin A. Hills. potatoes (Kans.-97). H. N. Barbam, George Kramer, and G. Nathan Reed. Effect of storage conditions on the viability of tobacco seed (Fla.-22). Randall R.
tor, and Rhodophora florida (N. Y. (Cornell)-55). Robert L. Patton. Pythium and Rhizoctonia (Wis.-139). L. F. Roth and A. J. Riker. Some chemical relations in the sugar beet during phases of its development (Ariz.-16). Inheritance of size in Single-Comb White Leghorns (Calif.-134). I. Michael Lerner. Length-of-day behavior of Nicotiana gossei (G-1301). H. A. Allard. 'Payable to the Superintendent of Documents, Government Printing Office, Washington. SMay be obtained from Farm Credit Administration, Kansas City, Mo. U. S. DEPARTMENT OF AGRICULTURE PENALTY FOR PRIVATE USE TO . FULL USE OF FARM MACHINERY AND EQUIPMENT . plies, building materials, rubber, and other critical materials. dealers, and public and private agencies which come in touch with farmers. all such efforts "under one banner" to obtain best results in the critical months ..
equipment is part of the over-all Government campaign to promote the produc- "
Fit and Fighting" to tie special activities together. The program has eight specific objectives based on the following points: ." all available farm production and transportation equipment. for maximum mechanical efficiency. '..
maninpowr which now must be used more efficiently to compensate for ... :. ...!!. War Production Board, Office of Defense Transportation, Petroleum AdminltI -. tlon for War, and U. S. Office of Education are cooperating in the progpam. Cooperating Industry groups include those who supply farm machinery ad.